Discussion in 'BigBox General Chat' started by Steven Burns, Apr 20, 2016. Has anyone used Taulman BluPrint and know what the BB temp settings should be? Wow! Sounds like a pain in the behind and I have never printed anything that hit before. Let me know how they turn out and I'll create a new s3d profile. And if any of the experts can let me know how you switch back properly? Realized I urgently needed a PLA print and that totally was a miserable experience, and still not sure my pathway isn't somewhat gunked up? Everything else has had a ~200c printing temp so easy to just run extra filament 2 to get rid of filament 1. I've even tried cleaning filament? No easy answer on cleaning other than a quick change V6 assembly which is still a pain with levelling and x-y positioning on a dual. It is an option that I will consider using once I get my build complete (a delayed process) and working but I suspect I will need to look at a metal mounting plate to give a positive location for the extruders. Unfortunately I don't have the mechanical workshop for that activity but I can draw it! Richard Horne has yet to publish his design as it is not finalised. is the cleaning filament safe at those temps? Never used it, always used the filament-purge process i.e. using the next filament but hand pushing it hard through the nozzle, pulling back a little, then pushing again. Remember that the printing temperature of the HT filaments is just that but they become liquid at lower temperatures so will purge. The T-glass temperature is one guide to where you need to be in temperature as this is the softening point, so add 40 or so to that might do the job or purge at 10 or 20 below the print temperature using your new filament. I am wary of using the blowtorch as this can cause carbonisation that will make the problem worse. I always remove the filament after a job and leave the hotend at temperature+5 to drain and purge with the next job. I never had problems for far. I use the temperature for the old filament at first, push the new filament by hand through the hotend. That way you are way over extruding much more than the normal extruder can achieve. So the new filament, though the recommended temp might be much lower, does not stay very long in the nozzle. I keep pushing until I get a clean extrusion of the new filament. Then I pause for some seconds, maybe pull back a few millimetres to give residue of the old filament time to melt with the new and then push again. OK we are back in business. The cleaning filament just needs to be run through at temp of the high temp filament (I had already done several hundred mm of the lower temp and then entwined to poor effect; ran 300mm through and it's running super clean now. Just started an entwined print and it is printing like it used to.The other great thing about doing this was that I moved the head out while still 265C and used the brass brush and all the little amounts of snot that accumulate on the nozzle and heater block, come right off. All nice and new and shiny. Funny you say that about the heat. My wife and I were talking about it last night and to put it in perspective, 265c is hotter than we cook our pizzas at!! I'll have to buy some cleaning filament and see how that works. Once I get the Bluprint to print successfully, I will share my s3d profile. Something worth considering is Boots own brand burns kit. @Alex9779 or @mike01hu any recs here? I did play with "coasting" but didn't have much success... I think you have to find a good balance between "coasting" which reduces the pressure in the nozzle, basically you stop extruding BEFORE the line ends and use the filament, that would normally ooze AFTER the line, to complete the line. So firstly you gotta estimate how long the "ooze" might be good to complete the line. And secondly from what I understand is that if you use that "ooze" you need some "extra restart distance" because the filament that oozes is missing in the calculations of the slicer, either if you intentionally use it with the coasting setting or accidentally while travelling. 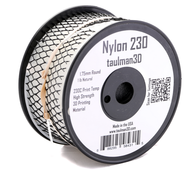 I just had "Bridge Nylon" and it stayed on the spool without the net. But this was 2.85 for the UM2. I can't wait to try out the T-Lyne, it seems indestructible, and it's what they recommended for me to try for my cryogenic project (superconducting high T coils for use in a pulsed 8T magnet system as it remains strong even at 25K - that's insanely cold BTW) although 910 is my other choice for that, but Taulman support said this can be problematic below 50K, but is better mechanically. T-Lyne (or Suralyn) is the coating on golf balls among other things, so has an astonishing set of properties. I bought it actually to try to print gears for my RC Helicopters. Hmm, I'm no expert here Henry compared with @Alex9779 and S3D is still an anathema to me as I still use Slic3r and Cura with my current printer but do try it now and then. My view on coasting is that it is a fudge for not getting temperature, steps/extrusion-multiplier and retraction right. Retraction is of course a pressure reduction feature as is coasting. But I do know that every filament has its own quirks and sometimes it is necessary to use witchcraft. I don't know what Alex thinks but I wonder if small objects like that could use a smaller nozzle perhaps with more retraction. As I have no experience with this material I can't comment on adhesion, so I will rely on you for the research. Bed calls as I have a 400mile round trip to party with great grandchildren and the rest of the generations tomorrow.